Investors who bet on a surge in interest rates this year have had their heads handed to them on a platter. The 10-year Treasury note yielded about 3 percent at the start of 2014, largely because of the uptick in interest rates that began in May 2013, when the Federal Reserve laid out its plan to scale back its bond-buying program. After a solid rally in the bond market, the yield on 10-year Treasuries has dropped to about 2.3 percent. Meanwhile, a strengthening US economy has prompted the Fed to reduce its open-market bond purchases. Consensus expectations call for the central bank to continue tightening after an extended period of accommodative policies. Nevertheless, the market’s demand from bonds remains robust, making value plays even harder, if not impossible, to find. Check out “Long Maturities, Low Yields.” How does a 2.642 percent annual return sound for a BBB- rated bond that doesn’t mature for more than 53 years? Buyers of Enterprise Products Partners LP’s (NYSE: EPD) bonds maturing in 2068 have made this leap of faith. Meanwhile, the municipal-bond market remains fraught with risk, as state and local governments cope with declining tax bases. Vanguard Intermediate Term Tax Exempt’s (VWITX) sheer size insulates it from these risks, but this best-in-class fund yields less than 3 percent and has returned an average of 4.78 percent over the past five years. In other words, the fund is a good alternative to cash, but that’s about all. As for government-backed mortgage securities, Vanguard GNMA (VFIIX) yields less than 2.7 percent and has returned 4 percent annually the past five years. Many closed-end bond funds have maintained their dividends despite the low-rate environment. But with investment income shrinking, many merely return capital to shareholders. Bottom Line: Investors must assume inordinate credit and/or interest rate risk to find a competitive yield in the bond market. Despite all the talk about rising interest rates, corporations and governments can still issue new bonds at the lowest rates in generations, enabling them to pay off high-cost debt and eliminate near-term refinancing risk. Moreover, these efforts stack the deck in their favor for future bonds sales. Limited refinancing needs mean that bond issuers can step back from the market if credit conditions tighten and yields rise. But the pension funds and other institutional investors that dominate the bond market have mandates to allocate a certain portion of their assets to fixed-income securities. This dynamic tilts the supply-demand balance in favor of bond sellers, bolstering prices and pushing down yields. Access to low-cost debt capital has boosted corporate earnings and stock prices; not even a doubling the 10-year Treasury note’s yield between late 2012 and late 2013 diminished this tailwind. If comments from the Federal Reserve spark concerns about rising interest rates, the resultant selloff in the Treasuries market could hit bonds and dividend-paying stocks; the prevailing wisdom has brainwashed investors into mistakenly treating these equities as fixed-income securities. But unlike bonds that pay a fixed coupon, the dividends that companies pay on their common stocks can grow with cash flow and earnings; investors who follow the conventional wisdom that these equities are bond substitutes will feel the pain and miss out on potential upside in the best-positioned names. 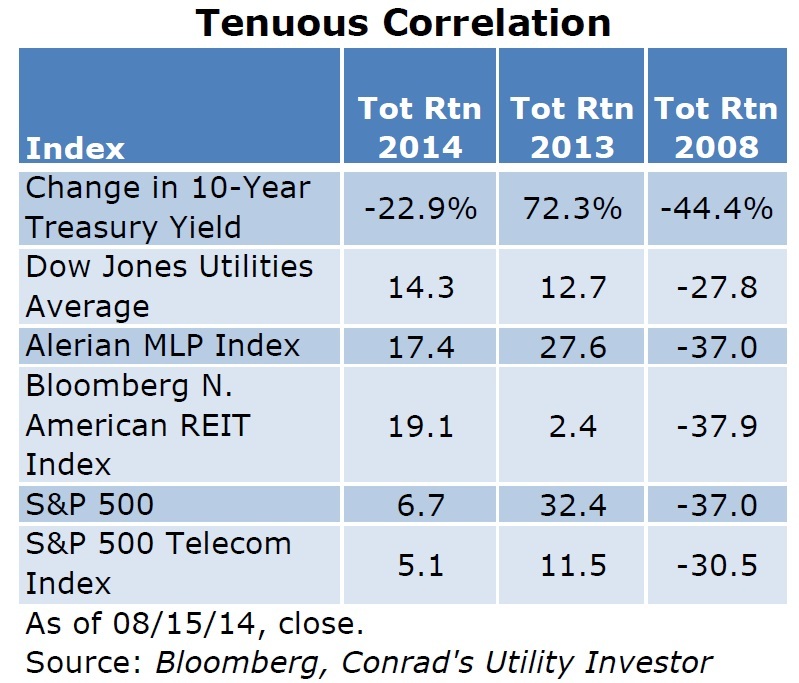 “Tenuous Correlation” tracks annual total returns for six stock indexes and the percentage change in the yield on the 10-year Treasury note. With the yield on the 10-year Treasury note falling by 22 percent this year, traditional income-oriented equities such as utilities, master limited partnerships (MLP) and real estate investment trusts have all moved higher. However, investors shouldn’t assume that the dividend-paying equities necessarily rally when rates fall and lose money when they climb. Last year, a sharp spike in Treasury yields didn’t prevent MLPs, REITs and utility stocks from positing solid gains. And when interest rates plummeted in 2008, dividend-paying equities endured their worst year in recent memory. Rather than interest rates, stock prices tend to track the underlying companies’ growth prospects, which wax and wane with the economy and industry-specific trends. If interest rates rise sharply enough, they can throw the economy into a shock. But a deflationary event can have a similar effect–recall Lehman Brothers declaring bankruptcy in fall 2008. Either scenario would be negative for stocks of all stripes, dividend-paying or otherwise. Over the past few years, I’ve published numerous articles and graphs making the point that dividend-paying stocks aren’t bond substitutes and tend to track economic conditions. My most recent blitz occurred in late 2013, in response to the selloff caused by the Fed’s taper talk. Investors who heeded my call and took advantage of the shortsighted (and, ultimately, short-lived) selloff in my favorite MLPs, REITs and utility stocks sit on handsome gains. In fact, the picks in my Aggressive Income Portfolio–available exclusively to Conrad’s Utility Investor subscribers–have delivered an average total return of 27.5 percent since the publication launched at the end of July 2013. But investors have piled into utility stocks this year, driving down yields and bidding up prices to frothy levels. At this point, many of my favorite divided-paying equities are well above their lows in late 2013 and early 2014, giving investors an opportunity to rebalance their portfolios and turn some of these paper profits into real gains. 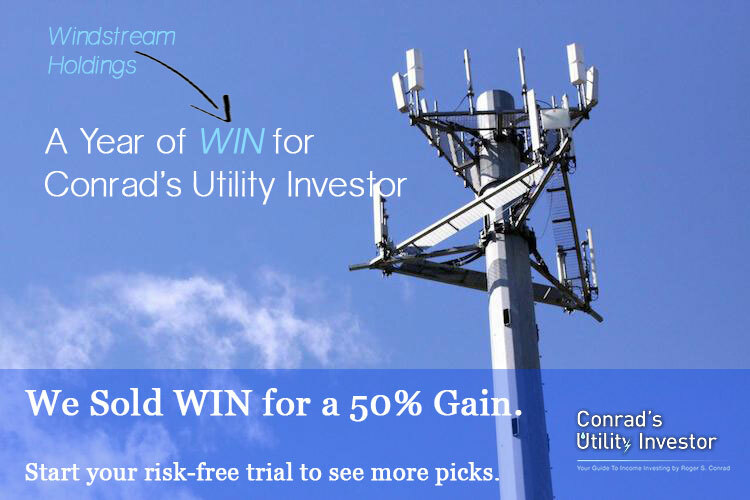 Two weeks ago, for example, we cashed out of regional telecom Windstream Holdings (NSDQ: WIN) for a 52 percent gain over a 10-month holding period. Investors should view these momentum-fueled gains with skepticism and adhere to the buy targets in my Utility Report Card, a regularly updated table that includes my assessment of more than 200 essential-services stocks. This feature forms the bedrock of Conrad’s Utility Investor. 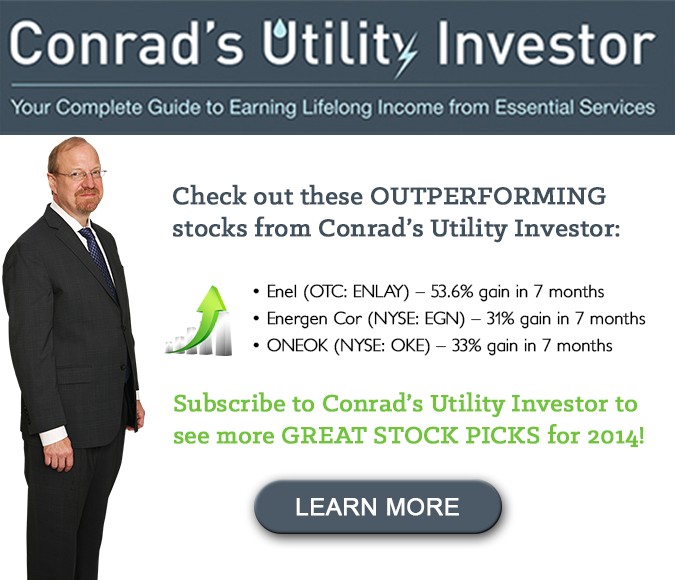 Learn more about my Utility Report and Conrad’s Utility Investor’s other features here. After the Dow Jones Utilities Average slipped about 9 percent from its all-time high, the August issue of Conrad’s Utility Investor highlighted some of my favorite stocks to buy. But over the ensuing weeks, the index has recovered about half those gains. Meanwhile, the Alerian MLP Index, which tracks a basket of 50 prominent master limited partnerships, has climbed to within a whisker of its all-time high. The Bloomberg North American REIT Index is also within striking distance of its recent high, while the S&P 500 Telecom Index has also rallied. The recent selloff in dividend-paying stocks had nothing to do with interest rates–the yield on the 10-year Treasury note declined between June 30 and Aug. 6–and everything to do with profit-taking after an extended rally. Recent strength in the S&P 500 Telecom Index likely reflected investors’ excitement over Windstream’s plan to spin off some of its network assets as a REIT. You can still capture generous yields from high-quality names that have solid growth prospects, but patience and discipline are critical to avoid overpaying and limit downside risk. As for bonds, decent values are even more of a rarity at this stage in the game. And only a substantial selloff will remove this froth from the market. Buyers beware. Closed-End Bond Funds: Proceed with Caution Afraid of Rising Interest Rates? Fed Policy in Focus The Fed Ends Quantitative Easing: What’s Next for Dividend Stocks?